Dog Friendly Pubs Edinburgh, Scotland. Large out door seating terrace all summer. Dog friendly all year around. Craft beers, homemade food and cocktails with around 100 Gins to try. 72-78 St. Stephen Street Edinburgh EH3 5AQ. Tel: 0131 225 2858. A proper pub. They brought Bailie a bowl of water in an old fashioned glass ashtray, he then curled up by the fire and had a little nap. They always have things going on there, Quizzes, Singers, even Poker nights. The food is good and they always seem to have a special offer on the beers. Check out all the stacks of board games in the corner. Traditional football focused pub close to Tynecastle Stadium known to regulars as “THE Diggers”. Bar snacks available such as toasties and soup. This is a proper pub, and also the pub Bailie himself is named after. It has a lovely big fire and an island bar in the middle. If you like sport, they show a bit of it but not the ‘big screen’ variety. It has a good Quiz Night, great food and I’ve always found the staff to be really nice. Good dogs are welcome in the main bar but not allowed in the food area to the back of the pub. 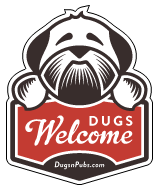 There are a total of 199 dog friendly listings in the Edinburgh Pubs category. Please log in, or sign up as a member to view all listings.